On our recent trip to Mount Baker we were reminded of the importance of taking small trips. The big trips to faraway lands will always take center stage because those travel experiences tend to change the way you view the world. They’re the game changers, the bucket list items. But the smaller trips, though often overlooked, are equally important. Those are the experiences that keep life in balance. They are the repeatable experiences that feed your passions and strengthen your relationships, the ones that keep you grounded and focused on what is truly important to you. Even though it’s located in northern Washington State, about 120 kilometers from Vancouver, you can see the snow-capped Mount Baker from almost anywhere in the Greater Vancouver area. You can even see Mount Baker from Victoria and Nanaimo on Vancouver Island. 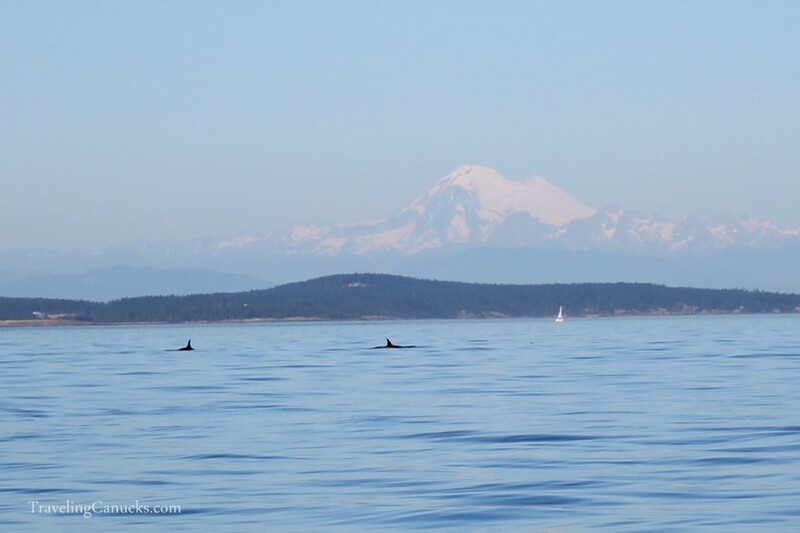 The above photo was captured while on a whale watching tour in the Salish Sea (just south of Victoria) – that stunning snow capped volcano in the distance is Mount Baker. Every winter we have a goal to snowboard on 5 different mountains. Whistler-Blackcomb and Cypress Mountain are our go-to mountains because of their close proximity to our home in North Vancouver, so we try to include 3 other mountains each year. Prior to having kids it was fairly easy to hit this annual goal, but it’s become more difficult in recent years. Fortunately, British Columbia and Washington are loaded with ski resorts, most within a few hours drive – including Mount Baker. Located in the Northern Cascades, Mount Baker is one of the most heavily glaciated volcanoes in the Cascades and it’s one of the snowiest places on earth. Every year the Mount Baker Ski Area averages 641 inches of snowfall, which is the most average annual snowfall in the world. 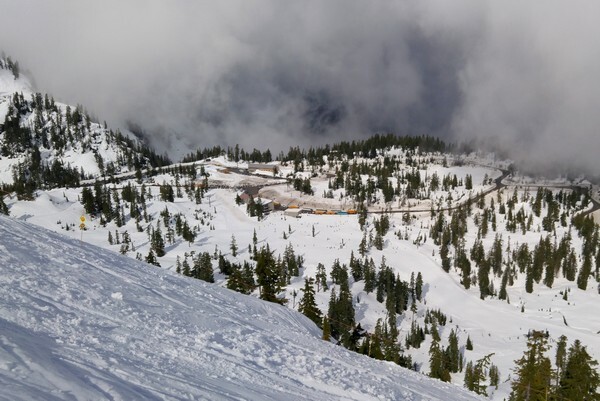 In 1999 the Mount Baker Ski Area set the world record for the most snowfall in a single season at 1,140 inches. That’s 95 over feet of snow – in one ski season! Last week we drove to Mount Baker for a few days of snowboarding, campfires and quality family time. We used to snowboard Mount Baker quite frequently but it’s been a few years since our last trip. I’m not sure why we don’t visit Mount Baker more often. It‘s a fun mountain that has a chilled out, ski-bum vibe. It’s not a very big mountain, with only about 1,000 acres of skiable terrain, but it has a lot of steep chutes and fun tree sections. Comparatively, Big White Ski Resort in Kelowna has 2,800 acres and Sun Peaks Resort in Kamloops has about 4,300 acres. Whistler-Blackcomb, on the other hand, has an incredible 8,200 acres of ski terrain. Unlike many of the ski resorts in the Pacific Northwest, there are no accommodations on Mount Baker and it does not have a cute alpine village to stroll around in the evenings. It’s a simple ski area with only a couple restaurants and ski shop/store for the essentials. This is not a commercialized mountain, this is a skier’s mountain. Because of this, we’ve hadn’t stayed overnight and always made Mount Baker a day trip from Vancouver. It’s about a 2.5 hour drive from Vancouver to the Mount Baker Ski Area, but timing is highly dependent on the US-Canada border crossing wait times. That all changed last week when we rented a cute alpine cabin just outside the town of Glacier, located about 30 kilometers from the Mount Baker ski area. Glacier is about as close as you will get to staying ‘on the mountain’. Most accommodations for Mount Baker are found along the Mt Baker highway between the towns of Maple Falls (population 324) and Glacier (population 211). There are only a handful of hotels, so most people will rent a cabin or vacation property. Glacier is a sleepy town with very little to it. In fact, if you blink you just might miss it. The remote town consists of a ski rental shop, a coffee shop, a couple of street-side restaurants and an info center. It’s basically just a fueling station to get supplies for your time in the Mount Baker-Snoqualmie National Forest. We found a spacious two bedroom cabin in the Snowline Community (picture above). There are several privately owned cabins in the gated community, so there’s a lot of variety. We shared the cabin with friends who also have two young children that are the same age as our boys. There was enough room for all of us (4 adults, 4 kids). The cabin has a private hot tub in the back and a big balcony with a barbeque in the front. It came stocked with firewood for the wood burning stove indoors and the campfire pit outdoors. 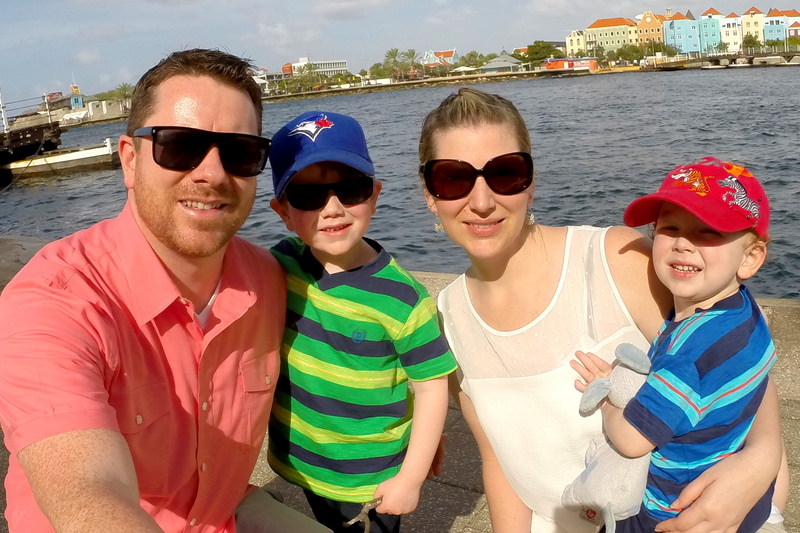 Given the poor state of the Canadian dollar, we hadn’t planned to travel to the United States until our currency bounced back to a respectable level (we got dinged pretty bad on our recent trip to San Juan, Puerto Rico). However, we had a US$500 credit with an apartment rental website that we worked with in the past and they unexpectedly informed us that we had to use the credit by the end of March. Rather than get upset about the company’s terrible approach to partnership, we decided to take a look at cabin rentals in the Mount Baker area. The weather was unpredictable that weekend. It was cold and rainy in the morning but by afternoon we had warm, spring-like conditions. This made for an interesting day on the slopes. We took turns snowboarding, while the other played in the snow with our boys. We thought about putting Braydon in ski lessons but the timing wasn’t right. He was perfectly content body sliding down the hill and throwing snowballs into the trees. It was quite warm that afternoon when we returned to the cabin, which made for perfect campfire conditions – and we LOVE campfires! We don’t normally have campfires in the winter because it’s too cold and the past few summers have been so dry that there’s always a campfire ban, so this was an unexpected treat for everyone. Of course, every campfire experience must include roasting marshmallows! Our weekend at Mount Baker reminded us that meaningful travel experiences don’t always require airplanes and long travel days. Sometimes the perfect trip is only a few hours from home. It reminded us how important it is to surround our boys (and us) with nature. We want our boys to have a childhood filled with adventures, big and small. We want them to embrace the outdoors and find comfort in an active lifestyle. It’s the little things that make a big difference, like roasting marshmallows over a crackling campfire. After only a few days in the forest we returned home feeling recharged and ready to tackle life’s next challenge. How about you? Can you think of a weekend getaway that’s been calling you? I totally agree about the importance of quick weekend getaways! We had a long weekend at the beginning of March, so my roommate took off to Pondicherry and met some friends there. It was only 3 days, but it was so nice to get out of the city and enjoy the sea air. I’ve been so bogged down with planning upcoming international travel that I’ve forgotten how great those short trips can be. Glad to know you enjoyed your little getaway as well! cooling place and enjoying sea air aot. Woww.. First of all this is a very beautiful place. I would definitely visit this place someday. I appreciate everything You have added to my knowledge base. Admiring the time and effort you put into your blog and detailed information. Mount Baker is One of my favorite spots across United States, thank you for sharing your experience, seems like i must start sharing my experience with the world. I just love to visit for winter-getaways in this adventures place. Skiing is one of the famous and most cherished winter sports adventures. There are a number of enchanting Skiing slopes and destinations all over the planet which attract a large number of Skiing enthusiasts from all over the world. Really Excited to go there! !